세조대의 회장저고리는 깃과 끝동, 섶과 옷고름 등에 짙은 배색을 한 회장저고리로 1975년 오대산 상원사에서 동자상에 금을 입히다가 불상 안에서 발견되었다. 불상이 세조임금이 1466년 상원사를 여러 차례 방문하는 중에 만들어진 것으로 보아 이 저고리 또한 1460년대에 누군가가 입었던 것으로 추정된다. 저고리의 크기는 길이 52.4㎝, 품 34㎝이며, 전체적인 모습은 품이 넓어서 소매길이와 저고리길이가 짧게 보일 정도이다. 깃은 네모로 각이 진 목판깃이며, 직선 형태의 소매와 짧고도 좁은 옷고름 등이 조선초기의 특징을 잘 갖추고 있다. 저고리의 전체적인 구성은 균형이 잘 맞으며, 색상도 전통적인 쪽물을 들인 염색이 잘 간직되어 있다. 같은 색깔을 옅고 짙게 하여 교대로 배치한 것은 의복의 배색효과를 잘 살렸는데, 이 점은 우리의 선조가 의생활을 단순히 흰색이나 원색에만 의존한 것은 아니라는 것을 알게 한다. 저고리의 뒷 중심선 우측에 ‘장씨소대(長氏小對)’라는 글씨가 있어 저고리의 주인이 세조의 후궁 중 장씨 성을 가진 사람이었을 것으로 추정된다. 현재 우리나라에 보관되고 있는 저고리 중에서 가장 오래된 것이며, 조선초기 저고리의 특징을 잘 보여주고 있다. 구성과 색상 면에서도 의복연구에 활용할 가치가 있는 자료이다. 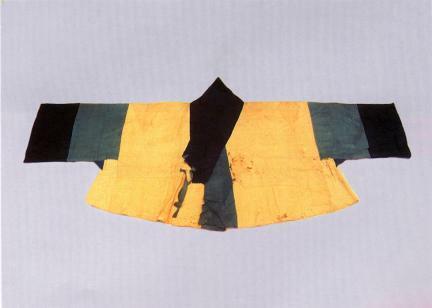 This Women's Ornamental Jacket has lapel, cuffs of sleeves, seop (long, hanging cloth attached to a jacket), and breast ties arranged in different colors. It was discovered from the stomach of a statue of the Buddha at Sangwonsa Temple in Odaesan Mountain while repainting the statue in gold in 1975. The statue seems to have been made in 1466 when King Sejo visited this temple several times, and this jeogori was worn by someone during the 1460s. It is 52.4 cm long and 34 cm wide. Due to the wide breast area, the sleeves and overall jeogori look short. 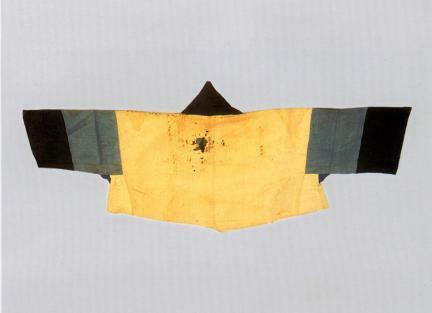 The jeogori has square lapel, straight sleeves, and short narrow breast ties, showing the characteristics of early Joseon Dynasty. Light, deep tones of the same color were arranged alternatingly, showing good color arrangement. This jeogori shows very well that Korean ancestors enjoyed various colors, not simply white color or primary colors. According to a writing on the left back side of this jeogori, the owner of the jeogori seems to have a last name, “Jang,” and that she was a royal concubine of King Sejo. As the oldest one in Korea to date, this jeogori shows the characteristics of jeogori of the early Joseon Dynasty. The composition and colors of this jeogori provide valuable information in studying traditional Korean clothing. ※ The title of designation was changed from “Baekcho Hoejangjeogori During the Reign of King Sejo” to “Official Clothing Worn by Jeong On” to “Women's Ornamental Jacket Worn during the Reign of King Sejo” according to the planning for changing the names of important folk cultural heritage (Apr. 20, 2005).